In normal circumstances the practice range is somewhere I go only when I feel it's truly necessary, like if I'm trying to make some sort of revolutionary swing change, have to re-learn to hit a ball and need the repetition. Not a fun, recreation activity. Some people might enjoy it; to me the driving range has about as much to do with actual golf as a drive-thru carwash does to actual driving. This snowstorm is a good occasion on which to open up a support group for everyone dealing with the complications of winter. Me, I'm fresh off playing some golf so I'm not actually feeling it just yet, but I will soon enough. Once it sets in, it'll be pretty bad I'm sure. We've been so lucky with the weather lately. Praise the golf gods. I used to joke around about the winter being my peak season. Well by now I don't think it qualifies as a joke anymore. No, it's reality. The numbers bear it out--I'm playing more lately than at any time last year, and as of the last few rounds actually seeing some positive trend in my scores. Train keeps on rolling; why the hell not. It's time now to look back on the year that was 2013. The popular or media-savvy thing might be to get retrospective in the last weeks of December, but my thing is, why not let the year play out entirely, then make our piddling assessments of what went down, through the clarifying lens of hindsight? is what I say. Also I was just busy. A couple days of warm and rain at the start of the week here turned out to be a gigantic boon--it cleaned up most of the snow cover, which had gone all dirty and granulated and hard. More cold temps followed, but a brief window of opportunity opened up late in the week. 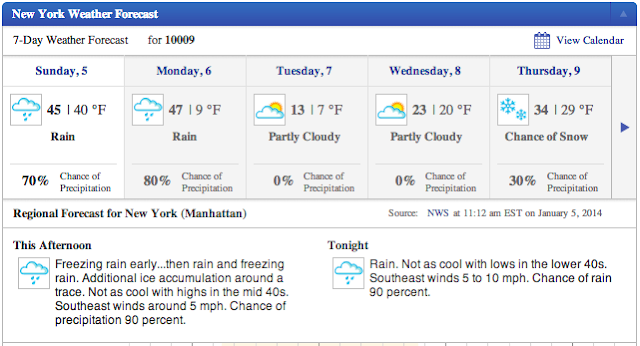 Now most people probably wouldn't consider 30° F an "opportunity" but hey it's your old pal Legitgolf. Master of layers. 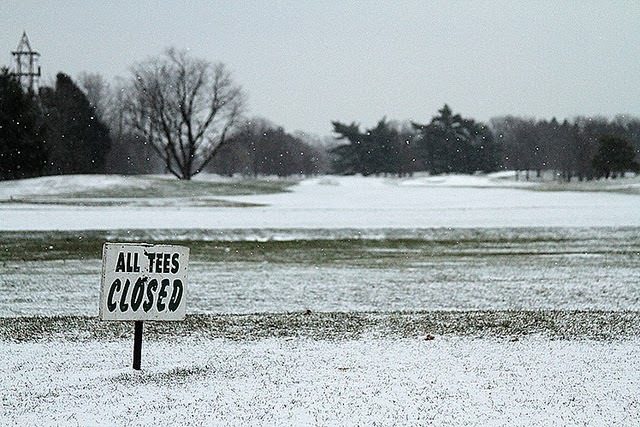 See, golf's great because it's a winter sport and it doesn't even know it (apologies to the late Mitch Hedberg). Seriously, you tell people around the water-cooler that you just got back from skiing in sub-zero temperatures and that makes you some kind of a cool guy. But talk about playing golf anywhere near the freezing point of water and you'll be considered some kind of lunatic. Where's the logic in that? I don't see it. 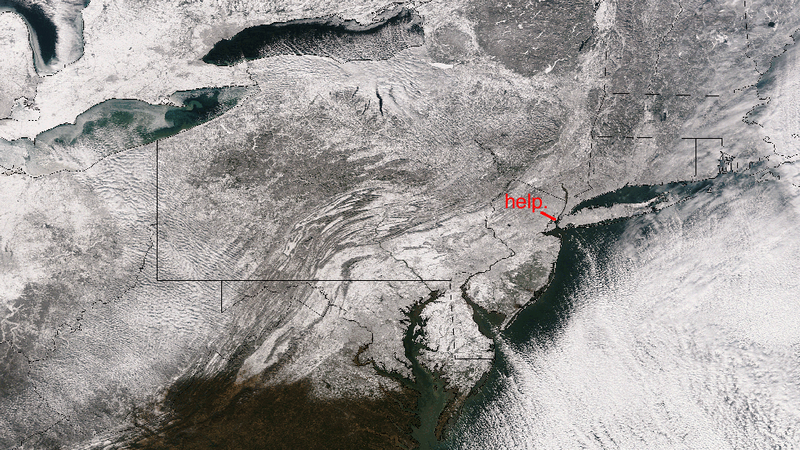 Some of you have expressed concern for all of us up here in the Northeast in the aftermath of the latest snowstorm. Judging by the satellite photo, the situation looks very bad. And judging by this sporting fellow I came across out by the East River, you might assume that we've now descended into desperate times. I remain unmoved however. I got a good fill of ghetto golf (and attendant douchebaggery) in the last days of 2013, and that's probably what's been keeping me going. Withdrawal will set in soon of course but no reason to worry just yet--there's a sliver of hope on the horizon. This storm might've covered a big area, but things aren't as bad as they seem--the mess it left behind wasn't so bad as to squash all hope of playing golf in the near future. Temperatures, which had dive-bombed into the negative digits a few days ago, are about to swing wildly into the upper 40s. As I write this, I can look out the window and laugh cruelly as the drizzling rain eats away at the snow cover. Rain--our unlikely ally in these frozen, perilous times. Hopefully the rain will macht schnell and clean this place up. Time is of the essence since on Tuesday we'll be hit with some more, potentially problematic arctic cold. But looking over the extendo forecast, there might appear a window of opportunity sometime around next weekend. Stay tuned!